The “Digital Revolution” is expected to drive many of the anticipated global sourcing trends, which will cut across industries and have a profound effect on how businesses evolve and transform their operating models. Strong growth in the sourcing market is visible. Large deals are being signed and many more are in the pipeline from Utilities, BFSI, Retail, Healthcare, and Public Sectors. The Digital Age is breaking traditional technology barriers and transforming service delivery through highly globalized and innovative business models. 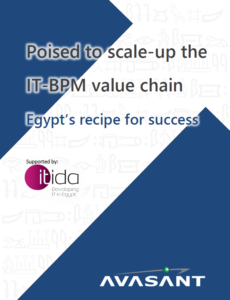 Key trends and dynamics in the market are expected to have a profound impact on Egypt’s strategic plans of re-positioning and differentiating the country as a center for higher value services.